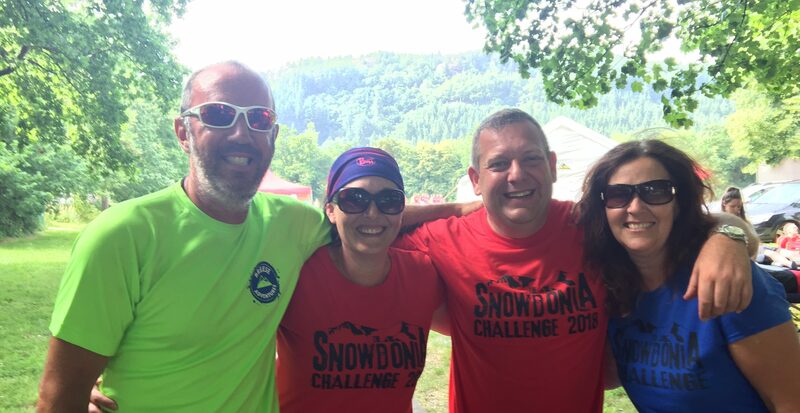 It’s a few weeks now since the second Snowdonia Challenge in Betws-y-Coed. 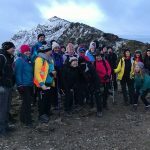 Three days where people come from all of the UK and further afield to walk 100km through some of the lesser known areas of Snowdonia National Park. Yet again this was a fantastic three days and we are so proud of everyone that took part. Whether that’s for their determination to finish, their friendship and support for others, the amount they have fundraised for their favourite cause, or just for being there and doing the very best they could. It was lovely to meet every single one of them. A lot was learned from last year. For us it was mainly about the advice we gave out for footwear… and lucky we did as the weather this year was far more suitable to lighter weight walking shoes than heavy walking boots! Those that took part also learned a few lessons on what the event involved and what they needed to do to make it the best adventure possible. You may have met Maria before. 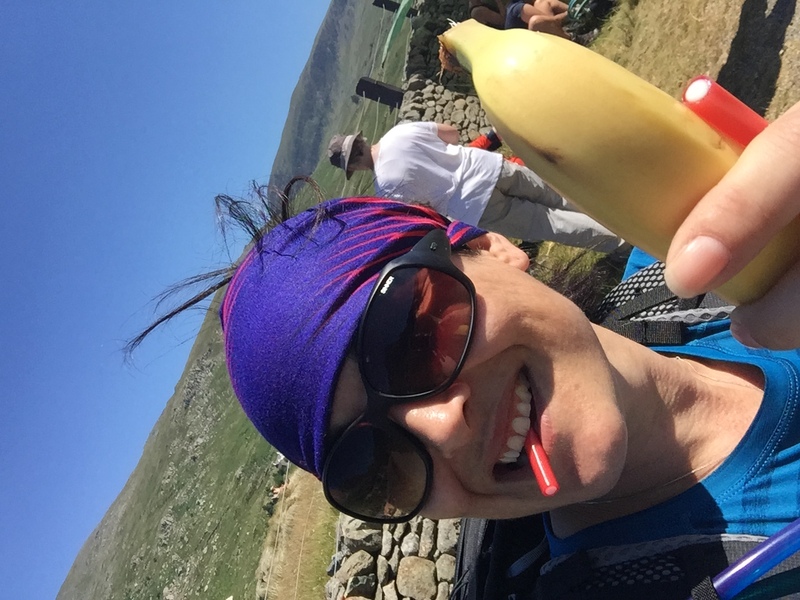 She took part in Snowdonia Challenge 2017 and inspired our entire team with her determination and positivity throughout, despite some struggles which she told us a little bit about in Maria’s Story. Well, on completing the three days in 2017 she tearily told us “I’ll do better next year!”. Well, here is a little bit about her journey this year…. Maria, what made you want to take part in Snowdonia Challenge 2018? 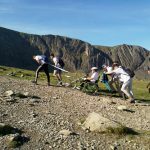 I completed the Snowdonia Challenge last year with my friend and it was seriously the toughest thing I had ever done. There were several times that I could have very easily given up due to pain that I can’t even begin to explain from blisters on my feet. The marshals that treated me were just fantastic and with the help of pain relief, I finished all 3 days…..Just. I was one of the last to finish and very emotional. So why did I volunteer to potentially put myself through all that again? 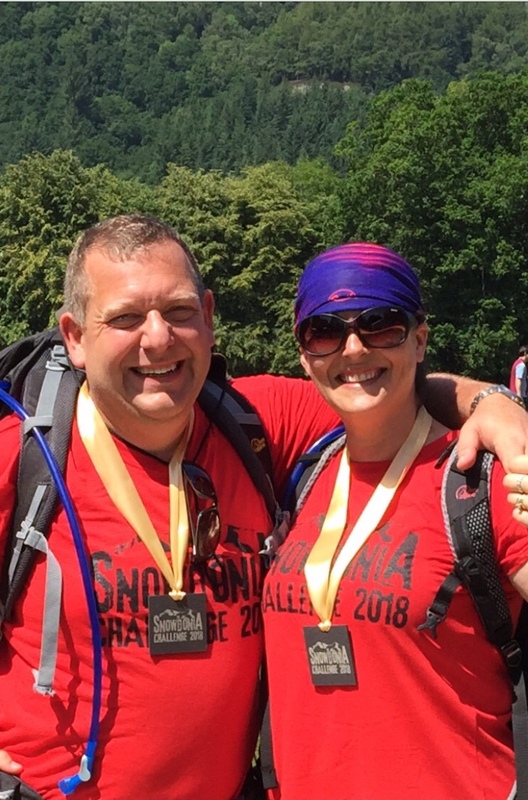 I knew that I could do it better than that with the amount of walking and hill climbing that I do, so I told Tracey and Stiwart….”See you next year and i’m going to do it better and blister free”. I almost did exactly that. I think we came in at 36 and 37 (according to one of the lovely marshals), so I definately did it better. Not quite blister free though, I had 2 that in all honesty I didnt know about until I removed the tape from my feet later that day. I’m going to take the challenge again next year too with my husband and a friend from my school days that I havent seen since I was 16 because she’s been inspired. The weather for a start!! Oh my goodness me, the heat was immense. It was a challenge in itself. I also completely rethought my footwear this year. Hiking boots were just not right for me for this challenge as I unfortunately discovered last year. I wore fell running shoes which have great grip but are a lot less rigid so the shock from hard terrain was a lot less. I also wore 1000 mile socks which claim to guarantee no blisters. I believe this combination was pretty near perfect for me and i’ll be doing the same next year. There were sweet and salty snacks at each water station along with bananas which were really welcome, just easy to fill up with water and grab some quick energy before moving on. The welcome announcement at the end of day 3 when we walked onto Cae Llan for the last time was totally unexpected and made me cry. It felt brilliant. Long walks with very heavy rucksacks (about 20 miles), Hill climbing, mainly the Wrekin and the Shropshire hills. Running and fast walking (on a treadmill) at 15% incline to get the leg muscles working. We still felt that we could have done more to prepare and we were both a bit worried when day 1 arrived. My husband. He did every step of my training with me last year but didn’t take part. This year he did and it was great. The sweets!!! Talk about going back to your childhood. Different sweets at every station that I used to have as a kid. It was quite exciting to see a water station ahead and wondering what was I going to have this time. Oh and definitely having my husband by my side. It has to be the heat, it was so unbelievably hot and at numerous times, there was no cover to excape for some shade. It was absolutely exhausting. What’s your best memory from the weekend? I’ve got loads, which I think I probably said last year too. Seeing my best friend who didn’t take part this year but came anyway to support us. Sarah and Ben, our hosts at Bryn Llewelyn had put a survival kit in the room for us for when we arrived which was full of snacks and energy drinks. Sarah and Ben also put a lovely card, a bottle of prosecco and 2 champagne flutes in our room to celebrate when we had completed the challenge. That was just wonderful of them. Our Dad and Mumph (this is not a typo ;)) drove all the way from Church Stretton to see us finish with a cool bag in hand and a chilled bottle of prosecco. 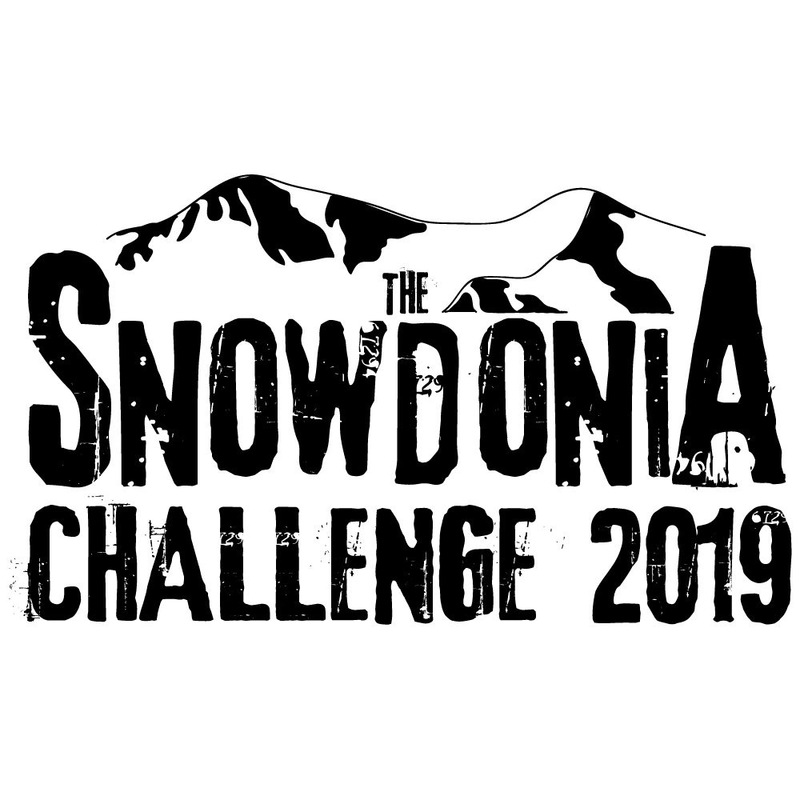 Unfortunately we had already crossed the finish line, had a cold beer, and were back in the room thinking about getting ready to go out for something to eat, when we had the phone call from them to say they were in Betws and how far away from finishing were we. My husband and I put our boots back on and ran (yes ran) back down the town to Cae Llan to meet them for an ice cream. What advice would you give to someone thinking of taking part next year? Do lots of long walks and lots of hill walking with plenty of uphill and downhill. Get some good shoes that fit well (get them fitted properly) and wear them in. Purchase some Kinesiology tape to protect your feet from friction and help prevent blisters. We also have rucksacks that take a 3ltr water bladder, this is great for taking regular sips of water without having to stop. 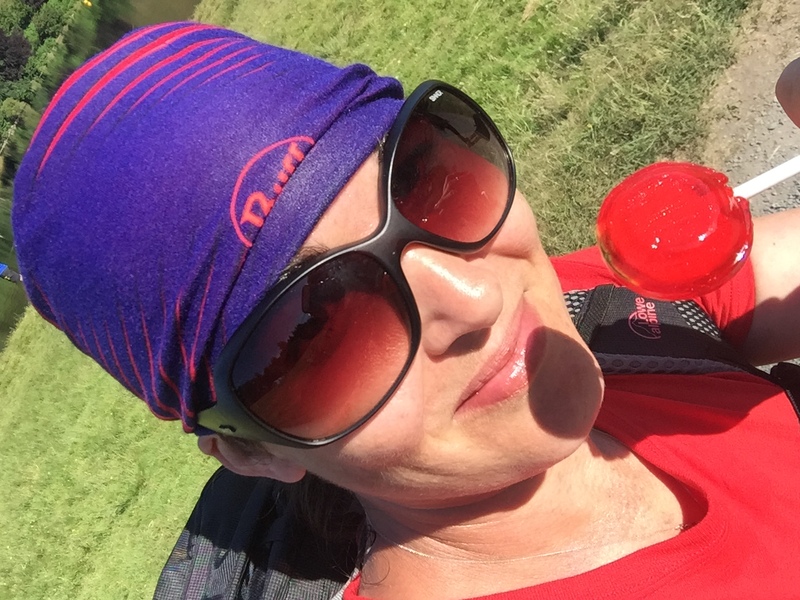 Take plenty of snacks with you to munch along the way, its a long way between water stations sometimes and little and often is better than waiting until lunch time and eating a big lunch (which you might not even feel like eating). Take time to look around you and take loads of photos, the scenery is a real treat. Don’t wear 3/4 length leggings if it’s really sunny, you’ll end up with an unfortunate tan line!!!! 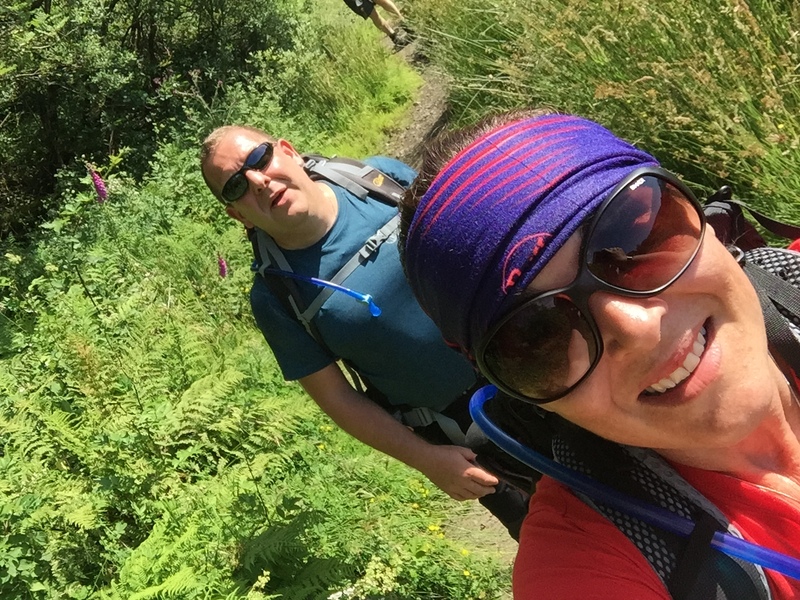 Maria and Russell decided to use their challenge to fundraise and raised £685 for Hope House.